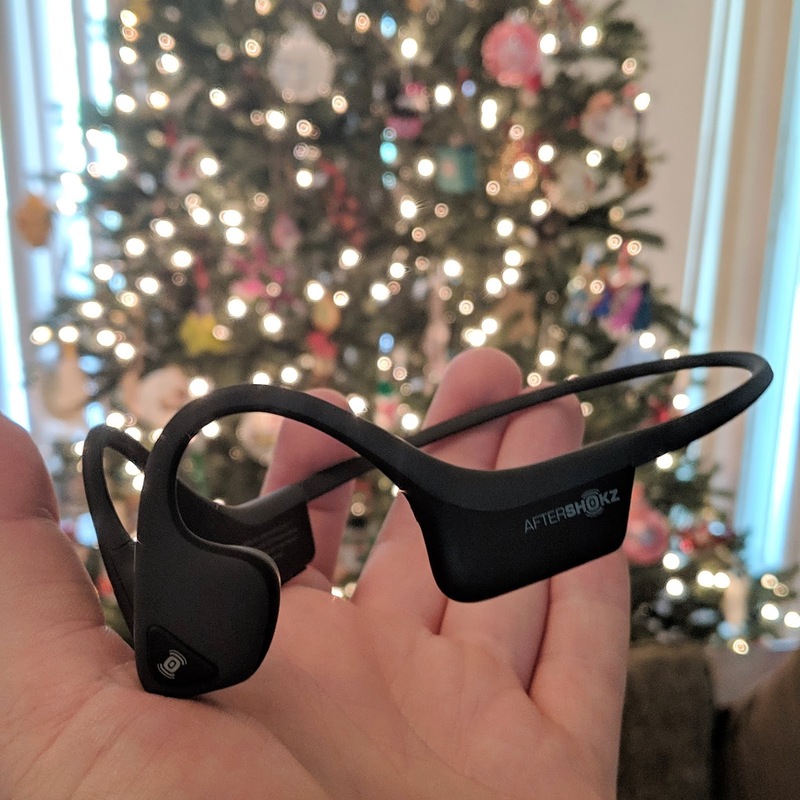 Disclaimer: I received the AfterShokz Trekz Air headphones to review and give away as part of being a BibRave Pro. Learn more about becoming a BibRave Pro, and check out BibRave.com to review find and write race reviews! I've always been big into promoting running safely. Bright colors, reflective gear, lights. But I also love my tunes when I run. To say safe, I fell in love the my AfterShokz Trekz Titanium headphones. 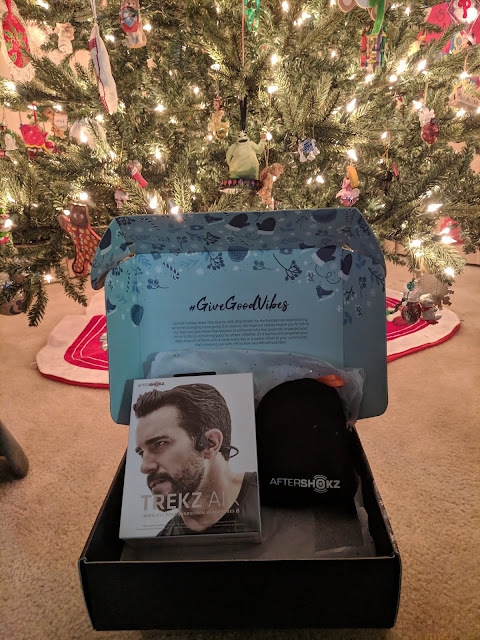 Two and a half years later, I've gotten the opportunity to upgrade to their newest version, the Trekz Air. The AfterShokz headphones use bone conduction technology. What does this mean? This means you get open air headphones that deliver music through your cheekbones. That means your ears are completely open to hear ambient sounds around you. This means you get your tunes but can hear everything going on around you as you run. But wait, there's more. They're 20% lighter then the Trekz Titanium. The wrap around design is light and comfortable. They're also IP55 certified, so they repel sweat, dust and moisture, from workouts and whatever Mother Nature decides to throw at you. As I mentioned the headphones are comfortable. They also sound really good. Yeah, when you're ear is open, you're not going to get the same high end sound of some over ear headphones but you get something much greater: safety. I used these for several hours working in the yard, hardly noticing them on. I got my music but could also hear the kids playing in the yard and when their disagreements got a little more "involved". Let's just say they're useful beyond the running path. 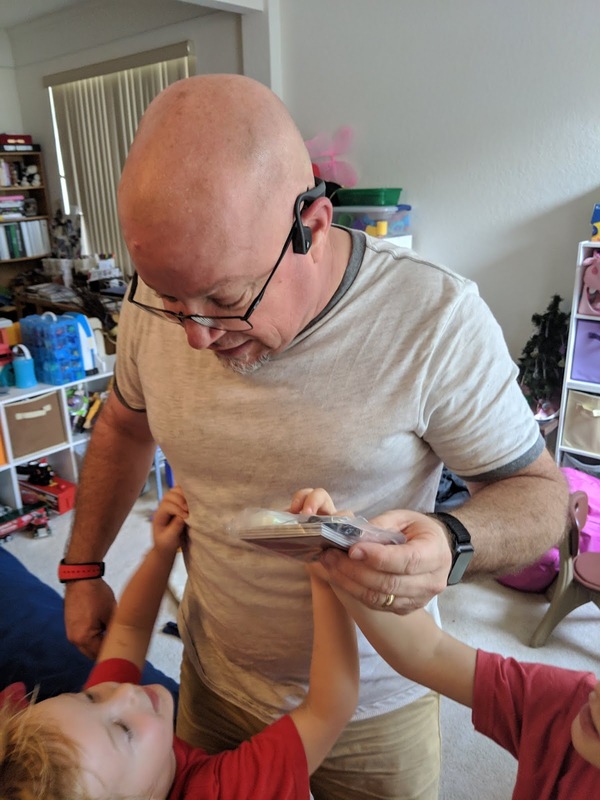 One of the really cool aspects of this was AfterShokz Give Good Vibes campaign. I got a second pair of headphones to give to someone I thought deserved something special. I always love to share brands I love, but it's not economical for me to buy headphones for my friends. This provided the perfect opportunity to share these with my friend and fellow runner, also names John. It was perfect timing to provide a little Christmas magic. His initial review was he "charged them up and they work great!" so they're a hit. 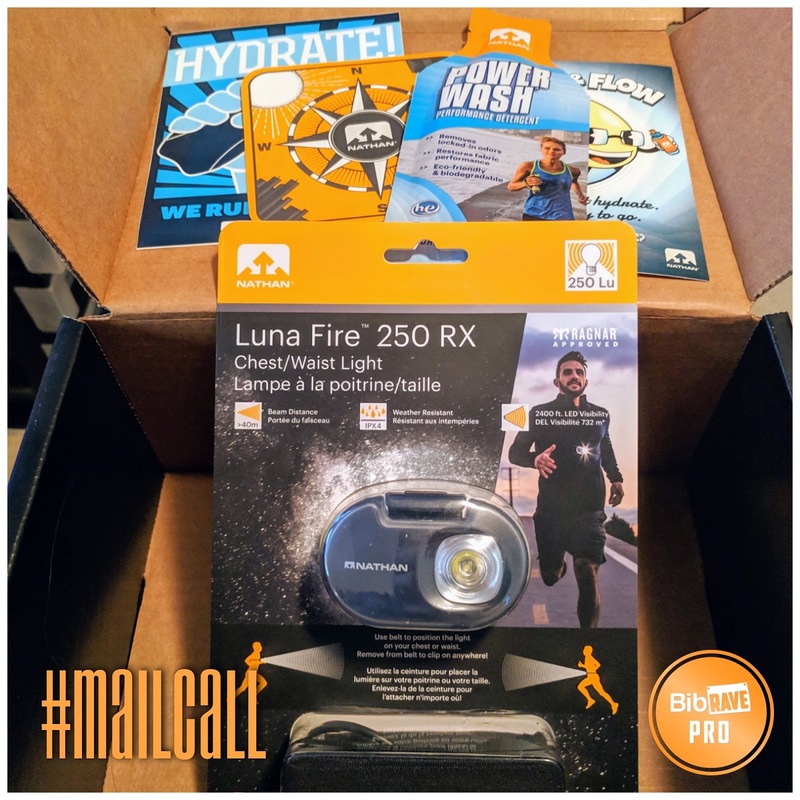 Disclaimer: I received the Nathan Luna Fire 250 RX Run Chest/Waist Light to review as part of being a BibRave Pro. Learn more about becoming a BibRave Pro, and check out BibRave.com to review find and write race reviews! I've always been big into promoting running safely. Bright colors, reflective gear, lights... I've always said better to be seen then be hit. 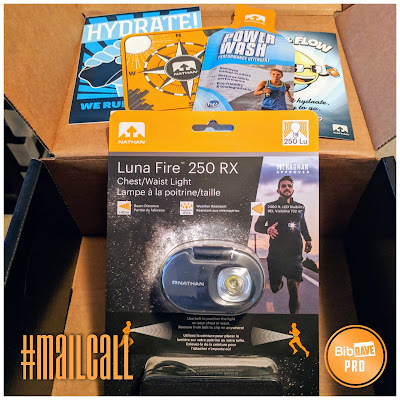 This is why I'm here to tell you about the newest product I've gotten to test and tell you about, the Nathan Luna Fire 250 RX Run Chest/Waist Light. This new light is powerful and versatile. It's a lightweight little light that can clip onto a provided strap meant to be worn on your waist or chest. It can also clip onto other gear you may already wear, particularly I wore it on another belt I already wear when running. The light itself is adjustable and provides a bright 250 Lumens. It also provides several settings: low, med, hi, boost, and strobe. From the technical side, it lasts for 25+ hours, is rechargable view USB, and is IPX4, meaning is weather resistant. Don't take it for a swim but it should be fine if you get caught in the rain. Small, powerful, handsfree, and rechargeable, what's not to like? With my life, I find myself running at the book ends of the day - early or late - so having a good light is always important. I also like one that I can use when I need it but when the sun goes up, I can turn it off but not need to "carry" it (or the reverse have it in case I don't make it home before the sun goes down). All in all, I enjoy it. Get your own and save with Nathan with code NATHANBIB20 for 20% off on up to $250! Disclaimer: I received entry into the K9s United for K9s 9K to review as part of being a BibRave Pro. Learn more about becoming a BibRave Pro, and check out BibRave.com to review find and write race reviews! 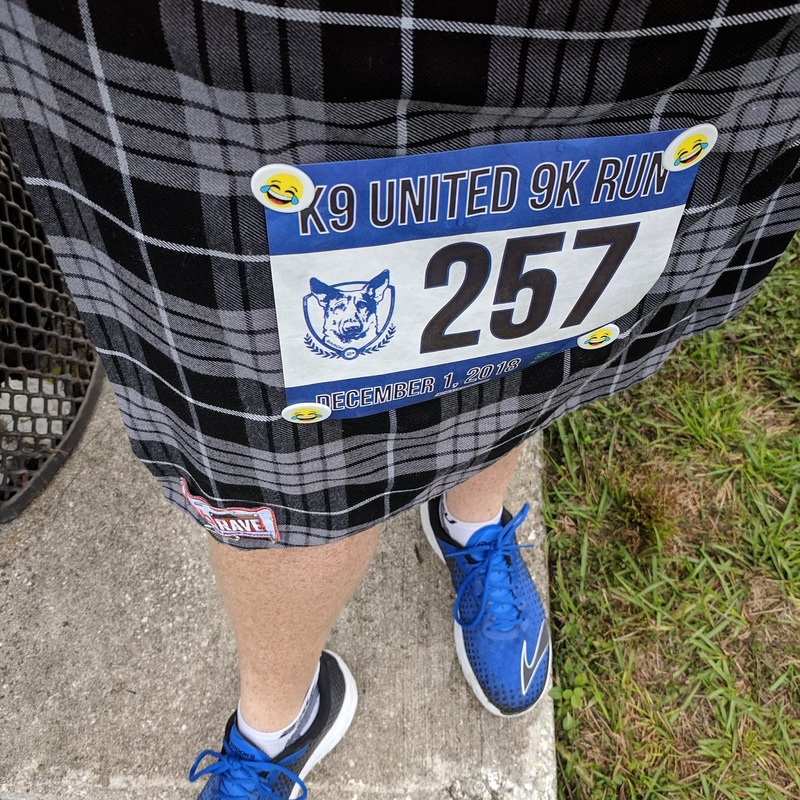 The K9s 9K marked my first race in a loooonnnnnnnnnnnnnnngggggggggg time. No, I don't feel like I'm really exaggerating that. It's been and up and down year and in all of that, running unfortunately took a back seat. It did feel good to lace up and get out there for this race this weekend. Race morning meant packet pick up for me. 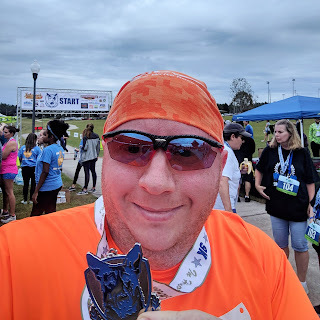 While a local Florida race for me (I like saying "local" and "Florida" together) it was however a bit of a drive, so I didn't really want to drive all the way up Friday after work just to get my bib. Thankfully they offered up race morning pickup, pretty standard for a smaller race. It was super easy. Parking wasn't too bad when I arrived at the park and they were using one of the ticket buildings for pickup that made it smooth. It included a race t-shirt, a drawstring bag, and a couple other small things from the vendors / sponsors. I was in and out in 5 minutes and back to my car to get my bib on my kilt. Then it was a simple walk down a hill to the start / finish area by a pavilion. There were plenty of police cars, as this was benefiting K9 units, a police helicopter, and several pop up tents with tables. The race itself was pretty nice. The race had a 5K and 9K, both starting together. It was an out and back course, shared, so once most of the way back, the 9K group had to go out and back again. It made for a fairly easy run. All flat paths around the park. The start was a little clunky. With both races starting up together, on a not too wide path, with walkers for the fun run and runners alike, it clumped, a lot. But it worked out pretty quickly. The water stops actually worked out pretty well. There were 3 stops but they were place strategically. Stop #1 was where the 9K runners turned around for a 2nd lap, so you saw them three times. Stop #2 was in the middle, so you passed them three times as well. Stop #3 was at the far end turn around, so you saw them twice. All in all, that made for plenty of available water. The weather was overcast, which kept it from getting too warm. All in all, it was a good day and a good run. Despite not running much, I did better then I expected. My official time was 1:19:33, giving me a 14:13 pace. I returned to the finish just as the awards were starting. I crosse the line, received my medal and a bottle of water. I didn't see any post race food around, but with the crowd for the awards, it may have been there, may not. I check the board for my official time, which was cool because they had a screen constantly running over the results. All in all, this was a fun little race. Easy, flat course, plenty of water, and an alright view. 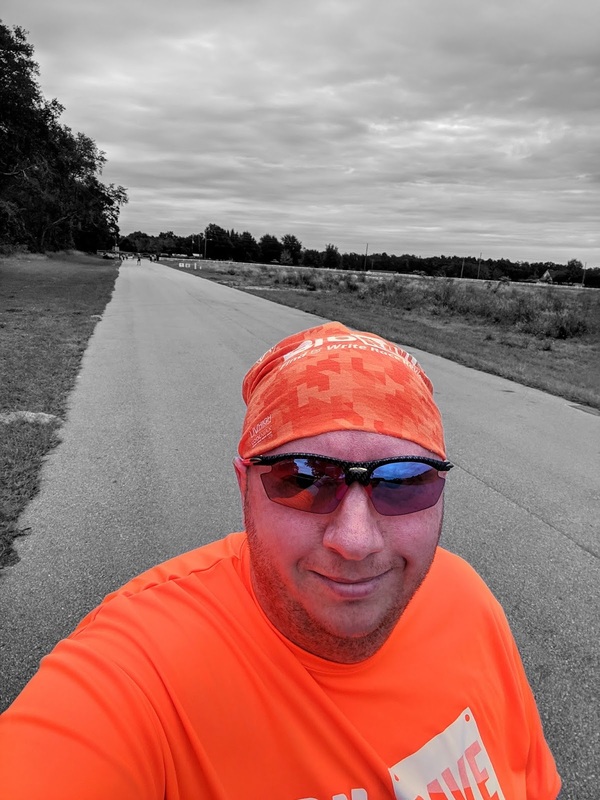 Check out my review on bibrave.com for the race and review your races! Disclaimer: I received entry into the Mount Dora Half Marathon to review as part of being a BibRave Pro. Learn more about becoming a BibRave Pro, and check out BibRave.com to review find and write race reviews! 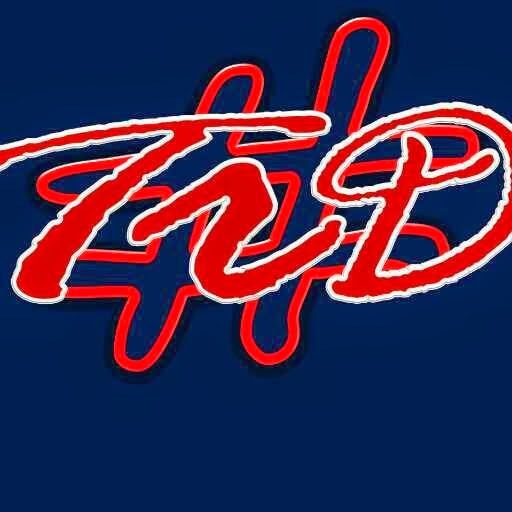 Looking for a half marathon to finish out 2018 with? Why not join me at the Mount Dora Half Marathon here in sunny Florida. It's been an up-and-down year - without a lot of running - so I'm happy to be pushing towards something and getting back at it. Perhaps you can join me for some winter running. My favorite distance to run is a half marathon. It's a challenge for me but also one I know I can push through on my bad days. That's why I'm excited to jump back in with a local race, the Mount Dora Half Marathon. You can join me December 15th and 16th, 2018 at Elizabeth Evans Park in Mount Dora, Florida located northwest of Orlando. There are two races for your running pleasure a 5K on Saturday and a half marathon on Sunday. If you're feeling adventurous, you can even run them both! I haven't run the race before, but I'm excited for the course from reading what they have to say about it. For the last 6 years 2000+ runners have fill the streets of the historic town of Mount Dora. This small town of 13,000 is filled with tree lined vistas of waterfront neighborhoods and lake-hugging roadways. Catch the rising sun through the gracefully swaying Spanish moss and watch the breeze dapple the lake’s surface with flashes of sunlight. The gentle rolling hills give this course a uniqueness of its own. 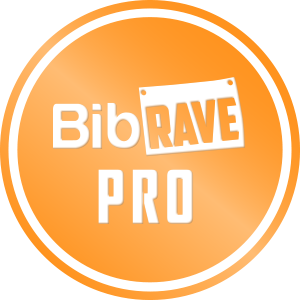 The reviews on BibRave also look great - checking BibRave is a must for new races for me. It's described as "gorgeous and challenging" and as a "small race [with a] big heart". Pam, who has run it every year since it started, describes it as one of her favorite races. Are you sold on joining me on race day? Being from the northeast - even though I'm a Floridian now - I'm so looking forward to running in Florida December weather. So come on out and join me! 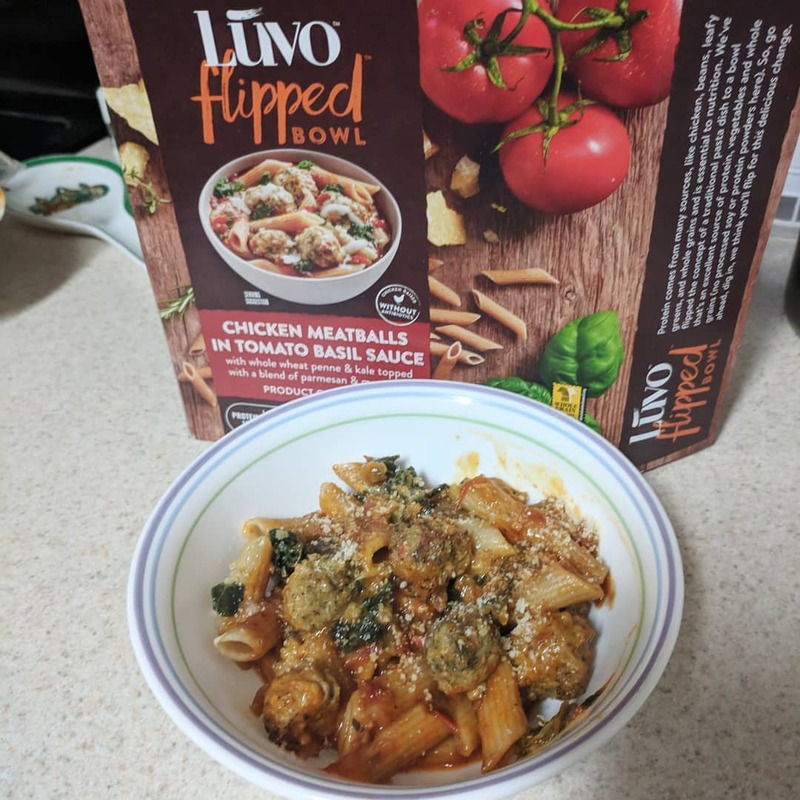 Disclaimer: I received the Luvo Flipped Bowl Sampler Pack to review as part of being a BibRave Pro. Learn more about becoming a BibRave Pro, and check out BibRave.com to review find and write race reviews! I recently received some of Luvo's Flipped Bowls to taste test. Earlier you may have read my post on the Chicken Meatballs in Tomato Basil Sauce and the Kale Ricotta Ravioli. Stroganoff is a dish I do not frequent, but is something I was interested in trying their variety of it. 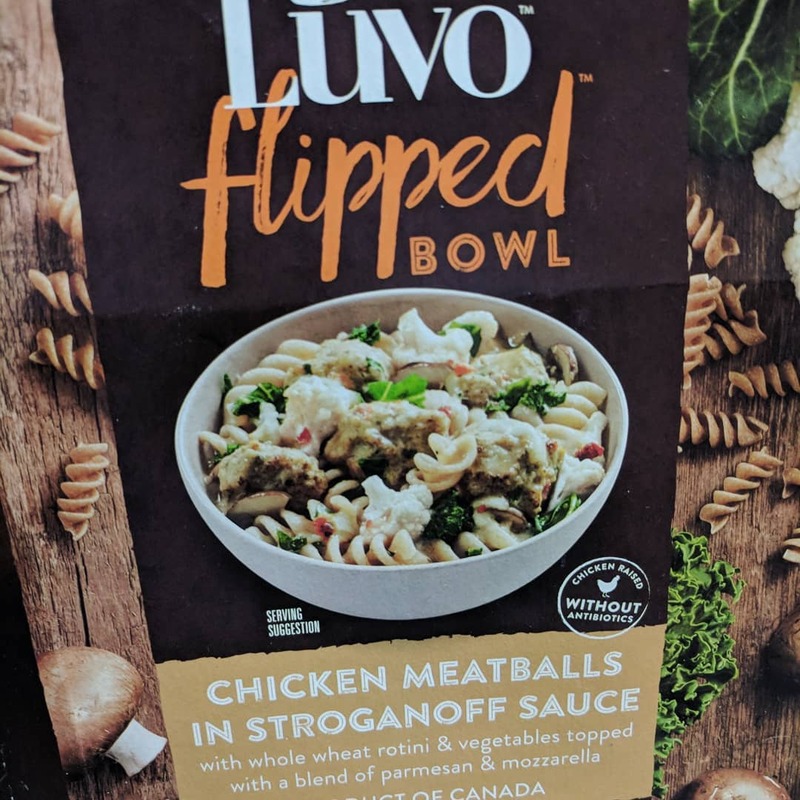 It starts with whole wheat rotini, the antibiotic-free chicken meatballs we saw in the penne, and then add Luvo's creamy stroganoff sauce. It also includes a mix of some vegetables as well. While not my favorite it was pretty good. It is definitely something different that is a good now and then. The stats on it a pretty good, offering 16g of protein (1/3 of which are from plant-based sources), 1/2 cup of vegetables, and 34g of whole grains. Next, we have yet another set of Italian flavors: the garlic wine sauce. They add this sauce to whole wheat rotini, white beans, greens, and antibiotic-free chicken meatballs topped with a blend of parmesan and mozzarella cheese. 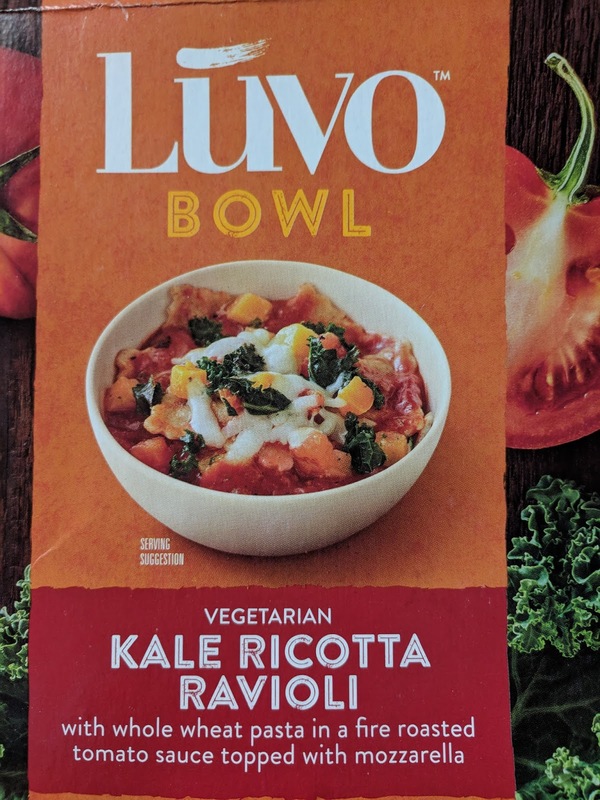 While sauce is pretty good, overall this bowl as not for me. The reason why is the white beans. I personally just do not like the texture. I ate them - as they were in the bowl and I know a healthy addition - it is just is not for me. This also offers some great stats: 17g protein, another 1/2 cup of vegetables, 32g of whole grains, and no sugar! The last bowl goes green and by green I mean pesto sauce. 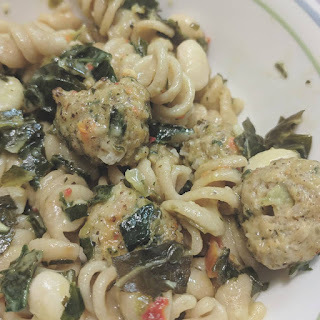 Whole wheat penne, antibiotic-free chicken meatballs, yellow squash, all combined with their creamy pesto sauce. 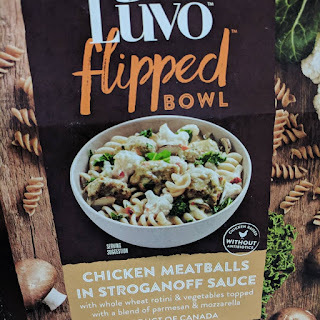 I usually do not go for pesto sauce on my noodles - I'm more a red sauce kind of guy - I really enjoyed this one. It is quite a pleasant surprise. It is a good combination, I enjoy some yellow squash, and overall enjoyed this bowl. The stats on it a pretty good, offering 17g of protein (1/3 of which are from plant-based sources), 1/2 cup of vegetables, and 31g of whole grains. I love food. I know, a real bold statement there. I do love food and in particular I love to cook. Cooking is relaxing, enjoyable, plus it allows me to make healthier options. However, cooking takes time, something I don't always have. Sometimes you need something quick. The problem comes that quick does not usually equal healthy (quick != healthy for my fellow geeks). This is where Luvo enters. I've reviewed some of their meals in the past - which I enjoyed. I even tried some of their Planted Power bowls - which were also good but lacking in one thing to me: meat. I'm all in favor of vegetarian and vegan options but for me personally I like a protein with my lunch. 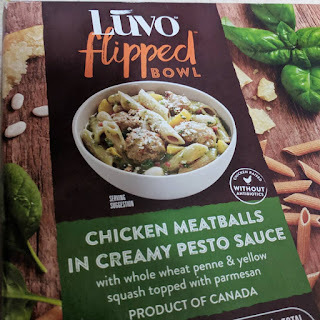 Now, I received round three, the Luvo Flipped Bowls. I'm going to start off with easily my favorite of all the bowls. It's their take on an Italian classic, penne and meatballs. It starts with whole wheat penne and adds a tomato basil sauce. They also add something you'll see a lot in these bowls: antibiotic-free chicken meatballs. Lastly, they add a blend of cheese. I love this one. Overall, the meatballs are pretty good. They're not grandma's meatballs, but they're a good addition to a bowl like this. The sauce on here is what makes this really good. It's much better than what you normally get out of a quick meal like this. I may have added a little bit of extra parmesan cheese myself, but that's just how I do pasta. The stats on it a pretty good, offering 17g of protein, 1/2 cup of vegetables, and 31g of whole grains. I know I mentioned my desire for meats in these bowls, but the other I'm reviewing in this post has no meat... but it is another Italian twist. Their ravioli starts with a ricotta ravioli and adds to kit kale, spices, and another good red sauce. I'm personally not a kale person, but it's good in here. It adds to the dish without being too much for me to dislike the kale. It's a good twist and better than any ravioli you'll get from a can, despite the chef on the label. 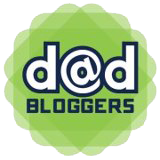 I'll have a couple more reviews in a future post for you. Be sure to have a look out for some stroganoff, some pesto and even some garlic wine sauce. Follow my Instagram @itshighlandjohn to see more as I try them. I'm excited to have some races coming up to end my year. It's been an up-and-down year - without a lot of running - so I'm happy to be pushing towards something and getting back at it. I'd like to tell you about a race I'll be running here in Florida and maybe you'll decide to join me. I'm excited to take part in this race that's a part of a growing race series for K9s United. You can join me on Saturday, December 1st, 2018 at the Apopka Northwest Recreation Complex for the K9s United 9K for K9s. This race day actually includes 3 races. Choose from the 1 mile fun run, the classic 5k, and the more challenging 9k. Both the 5k and 9k are timed, while the 1 mile run is untimed. 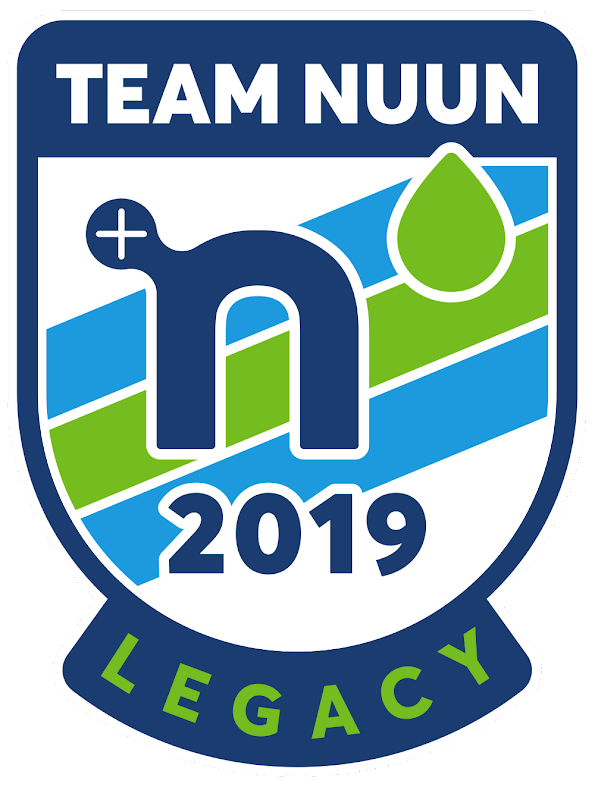 They even offer a virtual 5k or 9k options, so you can still be part of the fun and earn a T-shirt and medal. The best part is it all is supporting a great cause. 100% of the proceeds will benefit K-9s United an organization that is committed to supporting and honoring K-9 law enforcement officers who detect, protect and serve our communities by giving them the best equipment, amenities, and quality of life during and after their service, and memorializing those who give the ultimate sacrifice. K9's United is dedicated to providing the necessary equipment and training K9 law enforcement officers need in order to protect communities across the country, as well as memorializing those who give the ultimate sacrifice in the line of duty. Want to join me on race day? Use the code BIBRAVE18 to save 10%. Being from the northeast, I'm so looking forward to running in Florida December weather. So come on out and join me!